Used As Blood Purifier, Helpful in Skin Diseases, Reduces Rheumatic Pains, Sexually transmitted diseases. 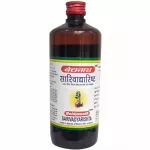 Sarivadyarista is a magical herbal remedy that is mainly used for curing skin diseases. Additionally, it may also be used to treat and prevent other skin issues too. Indicated by the name, Sariva extracts have been used as the chief active ingredients in it. Apart from this, other herbal constituents have also been incorporated to make this product work well. Due to cooling and soothing properties contained in this herbal remedy, it may be used to cure skin diseases of varying nature. It soothes down and relieves itching, irritation, inflammation and burning sensation on the skin. It may be used to treat and prevent the condition called as Scrofula. Pain caused due to rheumatism in the joints of the body may be relieved effectively. Syphilis which is a sexually transmitted disease can be treated effectively using Sarivadyarista. Similarly, carbuncles can be got ridden of with the help of this wonderful herbal preparation. 15 to 30 equal quantity of water or as directed by the physician.